Wardman Tower is one of Washington, DC’s true treasures, and is often described as Harry Wardman’s most iconic building. Wardman was widely seen as one of the region’s most prolific and influential developers during the late 1800s and early 1900s. After a lavish renovation by New York-based architects Deborah Berke Partners for developer JPG, the building was reopened in 2016 with 32 luxury condos for sale. This classic building is located at 2600 Connecticut Avenue NW at the corner of Connecticut and Woodley Road in the District’s Woodley Park neighborhood. Prices for these spacious and truly luxurious condos have recently ranged between $3 million and $9 million! The Tower was constructed by Wardman in 1928, at the site of his sprawling Spanish Revival-style home. Down came the mansion and up went a tower that became known as the Wardman Park Hotel. In time, the name changed to the Washington Marriot Wardman Park, an apartment and hotel complex that has been home to such luminaries as Dwight Eisenhower, LBJ and Marlene Dietrich. The eight-story, red brick tower with its signature vertical wings was included in the National Register of Historic Places in 1984. The hotel component still remains in place. Just how big are these upscale city homes? Floorplans run from 2,503 up to 4,648 square feet for two, three and four-bedroom units, as well as penthouse residences. Each home is unique, occupying part of a wing and radiating out from a central core. Among the features are six-inch Oak floors—portions of which are in herringbone patterns—plus large picture windows and custom crown molding. The gourmet kitchens feature polished quartz counters, Danby marble backsplashes, Thermador stainless steel appliances and custom-built American Henrymade cabinets. Also worth noting are the lavish bathrooms with their stone mosaic tile, heated floors, Porcelanoasa Krion counters, Toto toilets and Waterwork fixtures. In city known for condominiums with full service amenities, Wardman Tower truly goes the extra mile. Residents enjoy two lounges, a fully-equipped catering kitchen and bar, a spa-quality 2,000 square foot fitness and yoga center, and lush landscaped grounds. If that’s not enough, you can also toss in at least two parking spaces for each unit, a rooftop terrace, library and nine full-time staff members including concierge, doorman, valet parking and porter. The small Woodley Park neighborhood is also part of the attraction. Long-ago presidents like Grover Cleveland and Martin Van Buren once maintained summer homes here. 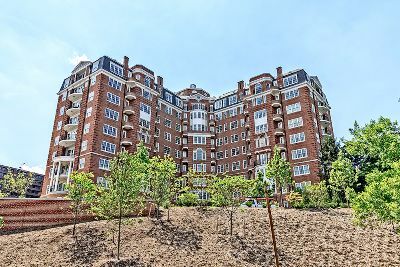 Bordered by Cleveland Park to the north and Kalorama and Adams Morgan to the south, the well-heeled community is also the site of the Smithsonian National Zoo Park. Another perk is the Woodley Park-Zoo/Adams Morgan Metro Station, just steps from Wardman Tower. For more information about this prestigious address, please contact District Partners Real Estate, LLC, at 202-798-3600.